The United States has over 4,000 megawatts (MW) of solar photovoltaics (PV) connected to the grid, with the pace of new installations accelerating as the price continues to fall. There has never been a better opportunity for Americans to generate their own electricity on-site nor such a challenge to the electricity system paradigm and for its policy makers and regulators. The greatest challenge is to prepare: although only 0.1% of electricity is generated by solar power in 2012; within a decade, 300,000 MW of unsubsidized solar power will be at parity with retail electricity prices in most of the United States and more than 35 million buildings may be generating their own solar electricity sufficient to power almost 10% of the country. Solar parity begins in areas with strong sun and high electricity prices. In some places (like Hawaii) that has already occurred. In several parts of the country, e.g. southern California, New York, parity is just around the corner. 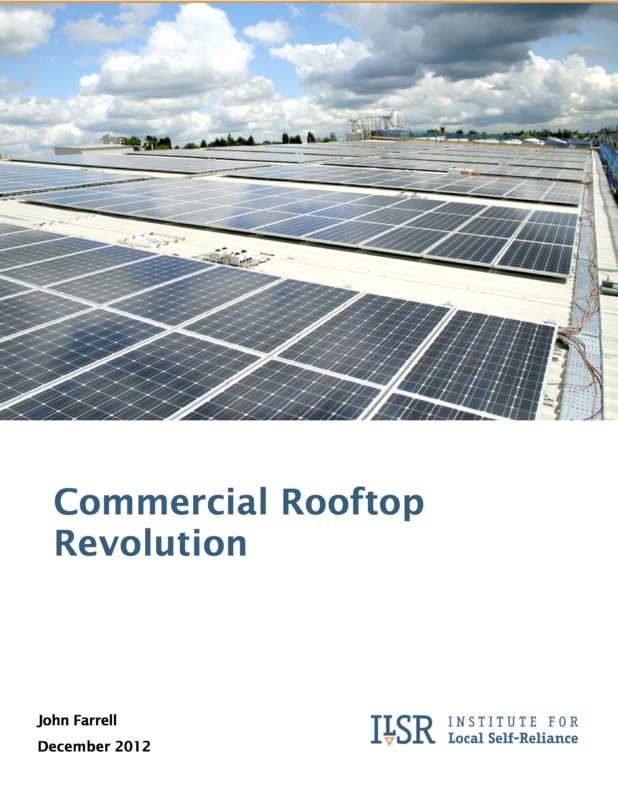 Commercial solar represents a third of the total installed base for solar PV and it has grown faster and the price has fallen more rapidly (by nearly 30% in two years) than for residential solar. Meanwhile, retail electricity prices have risen by 3% per year in the past decade. Until now, the solar energy boom has largely been driven by federal tax incentives and state-based incentives. But incentive policies will also need to change to accommodate the uneven geographic distribution of unsubsidized solar at price parity. Furthermore, almost all attention on solar power has been focused on cost, but industry, utilities, and policy makers need to begin addressing significant non-cost barriers that will become prominent as parity arrives. 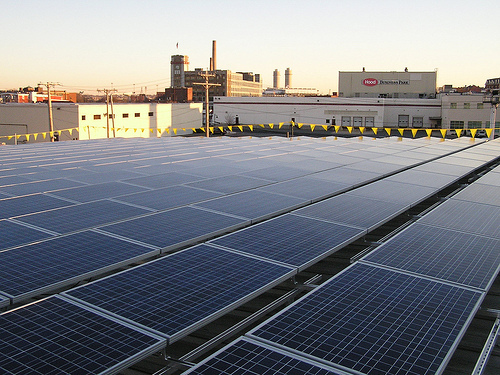 Falling solar costs will result in 33,000 MW of unsubsidized commercial rooftop solar achieving price parity by 2016, enough to meet 2.7% of commercial electricity demand. Falling solar costs mean 122,000 MW of unsubsidized commercial rooftop solar will be at price parity by 2022, enough to meet 10% of commercial electricity demand. Although commercial solar is growing faster, unsubsidized residential solar has a significantly larger parity potential (190,000 MW by 2022, compared to 122,000 MW for commercial solar). Together, unsubsidized residential and commercial solar at price parity could provide 9% of total U.S. electricity by 2022. 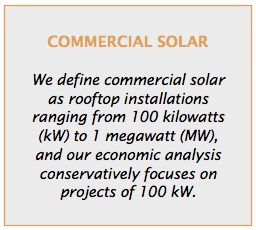 As the economic barrier shatters, other barriers to rooftop solar emerge: archaic utility rules (e.g. 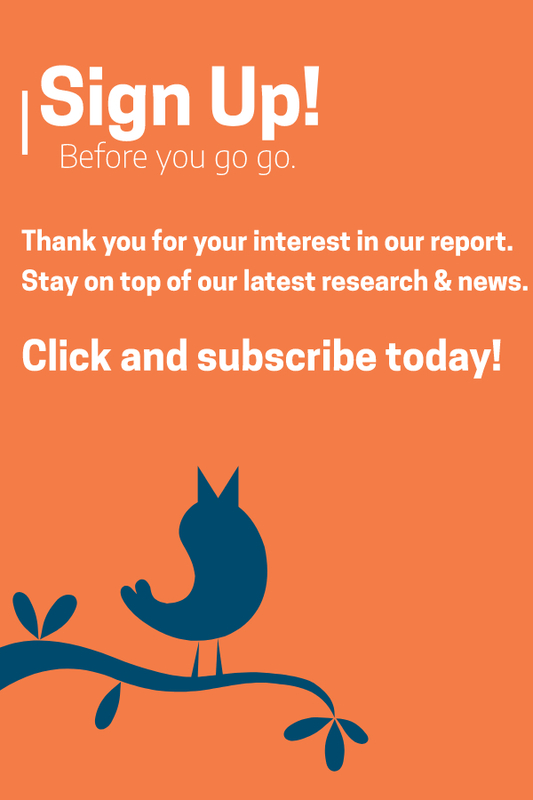 the 15% Rule), net metering caps, limits of local permitting offices, and a dearth of state virtual net metering policies. 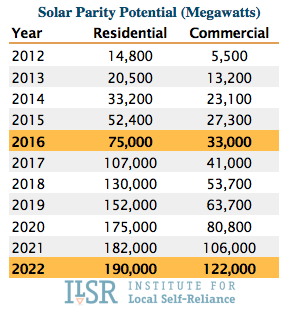 The following table shows the parity potential for residential and commercial solar power by year. For example, in 2016 when the installed cost of solar will approach $3 per Watt, there’s a potential to install 75,000 MW of residential solar and 33,000 MW of commercial solar in utility service territories at prices competitive with retail electricity. Existing federal and state incentives expand and accelerate the parity opportunity, but also create pitfalls. The sudden reduction of the federal tax credit in 2016 could set back solar markets in several states by 5 to 6 years. But without incentive changes, the tax credit may over-reward producers in sunny states at the expense of those in states with nascent solar markets. Policy makers need to replace a one-size-fits-all incentive program with one that can adapt to the rapidly falling cost of solar and variations in regional competitiveness (e.g. a CLEAN Contract). It will also be necessary to address unexpected barriers to solar that emerge as the cost issue fades away. 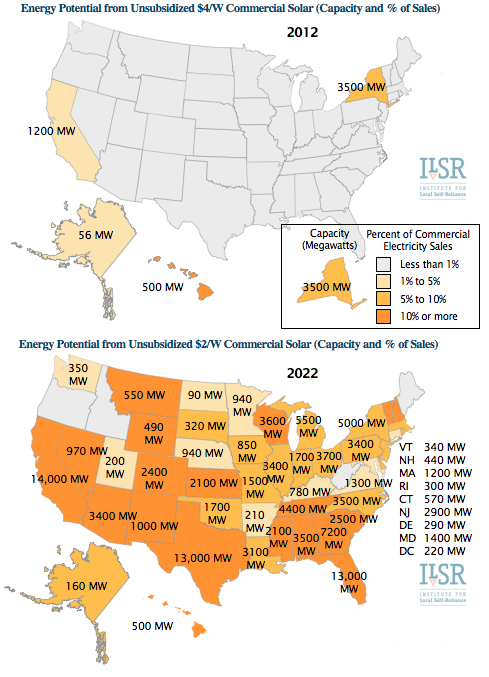 The following maps illustrate the enormous potential for the spread of solar at retail price parity. An impressive 5.5 gigawatts of solar is already at price parity in 2012, rising to 122 gigawatts in 2022. Awesome report, John. That is really interesting. I hope you are right and this starts to take off. Meanwhile, are there other sources of electricity that may achieve price parity more quickly, or is solar the number one player in the alternative energy market? Thank you for publicizing this information on falling PV prices. However, I am concerned about your figure on electricity production from solar technologies, and would like to offer a friendly correction. Accoring to EIA data, the US produced 6.76 TWh of electricity from solar technologies in 2011, which amounts to 0.17% of consumption, and is projected to produce 10.2 TWh in 2012, which should be more like 0.26%. EIA data is confusing, and elsewhere the use the 0.1% figure, which I am guessing is based only on utility-scale solar. However, given the 5.7 GW of solar PV and CSP that we had installed in 2012, the 0.1% figure seems unlikely; you would have to calculate unrealistically low production. And frankly, the EIA figures seem low. We clearly have a long way to go, but not as far as the 0.1% suggests.